The basic purpose of developing a C programming tutorial for this website – CircuitsToday – is to make it useful for people who wish to work with embedded systems. Really good C programming skill is an essential to work with embedded systems and “Pointers” is the most important concept in C that should be mastered by an embedded systems programmer. “Pointers” are so important because it enables a programmer to work directly with memory of the system. 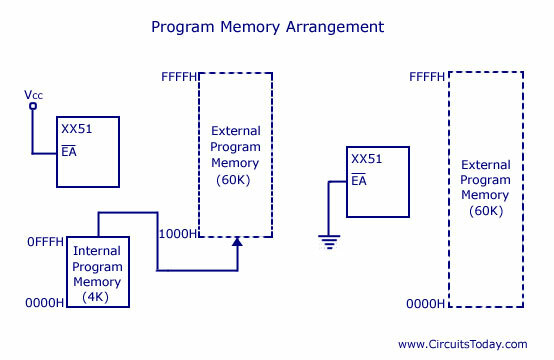 Memory of a system is organized as a sequence of byte sized locations (1 byte = 8 bits). If the total memory of the system is 128 bytes then there will be 128 accessible locations of 1 byte each. Each of these 128 locations are numbered from 0 to 127 in a special manner like 0000, 0001, 0002 …etc. The number associated with a byte is known as the address of the memory location. A pointer is an entity which holds the address of a memory location. So if the address of a location is 2050H, pointer is used to hold this particular address. Note:- Address of a memory location is always a positive integer. The range of address is from zero to a positive integer constant (which is the address of the last memory location ). We can use variables to hold address of a memory location and such variables are known as pointer variables. We have seen before that normal variables are used to store data items of a particular data type (char, int, float etc). Before using a variable in a program, we declare it at the beginning. Similarly we need to declare a pointer variable too in a special way – to let the compiler know we have declared a variable as a pointer (not as a normal variable). To do this we have the * operator – known as indirection operator in C.
Here we have declared a pointer variable of name ‘ptr’ and it is of type integer (int). Why we need data types in pointers ? The first doubt that may come to many is, why we need data types to declare a pointer variable. Well, here is the explanation. The address of a memory location will contain a data – rite? And it can be of type char, int, float etc. The difference between all these data types is in the size allocated to each data type. Char – is 1 byte where as int – is 2 byte and float is 4 bytes. Memory is allocated to all these data types as sequential blocks. Lets start memory allocation from 2000H. Now the character variable ‘a‘ will be allocated 2000H (1 byte), where as integer variable ‘b’ will be allocated 2 bytes using 2001H and 2002H. Finally the float variable ‘c’ will be allocated 4 bytes using 4 consecutive locations – 2003H, 2004H, 2005H, 2006H. Now you might get an idea of why we need data types to declare pointer variables. It is because memories are allocated in sequential blocks according to the type of data holded in those locations. Note:- In fact we can actually declare a pointer variable without any data type using the keyword void. It is known as a void pointer. The topic of void pointer has to be explained separately – so I will explain it in my next post. To make use of a pointer and it’s capabilities – the address of a particular memory location must be assigned to the pointer. It is possible to assign address of single variable or that of an array or the address of a structure etc to a pointer variable. This capability makes pointers the most powerful tool in C programming. We can literally play with the memory of a system using pointers. To assign address of an entity to a pointer variable – we use the & operator (address of operator). The operator & fetches the memory location of a variable. We have seen upto assigning an address to a pointer variable. Now how to get the content inside the memory location using the same pointer variable? For that we use the same indirection operator * used to declare a pointer variable. int a=10; // Declaring a normal variable 'a' and assigning value 10 to it. So that is enough for an introduction to pointers. If you have any doubts – please comment here! A good website to learn from basic… Itz really be useful. Please keep on updating.. Especially in embedded C .. Thanks sumir for the nice words.. I have, Strongly request to not published this comment. For that we use the same indirection operator * used to declare a pointer variable. For that we use the same indirection operator * used to get a value pointed by pointer variable. I think this site is very useful for every student, if this site contains any mistake, it’s our(Reader) responsibility to find and remove such these mistake. In the line “For that we use the same indirection operator * used to declare a pointer variable”, the author is trying to say that, we use the same * operator that we have used to declare the pointer. And your correction says what is going to be described later. What I meant has already been pointed out by Anish. I am in the process of developing a complete tutorial for C programming (focused on embedded systems). You can expect elaborate articles on pointers. Very Very Nice though it’s short topic about Pointer. But it contain’s so many important data for understanding Pointer. It is short explain but so useful for me thank U!! The Websie above is not belong to me but it is my University Website! !